Advice: carefully choose your seeds , as certified seeds are treated with fungal treatment which protects them against these diseases. the major diseases that may affect growing sorghum are linked to types of fungi like Fusarium or Macrophomina. These fungal diseases are generally developing in the second part of cycle; they cause rotting for both the collar and the bottom of the stem, involving in the worst cases food disruptions, desiccation of plants and lodging problems at the end of the cycle. Their development is essentially linked to climatic stresses (high temperatures and water stress) during the grain filling. Symptoms are characterized, for the two diseases, by tattered internal webs at the bottom of the stem, associated, for the fusariosis, to pink and even purple internal discolorations and, for the Macrophomina, to the presence of microsclerotia. The risk may be reduced by decreasing sowings density, and with good irrigation management: choosing a soil with weak water reserve and an input of water during the grain filling stage may be an effective solution. Concerning fusariosis, selecting the right varieties is strongly recommended. In risky situations, wireworm damages may affect sorghum. Attacks will mainly occur during the germination stage –emergence. They cause losses during the emergence. 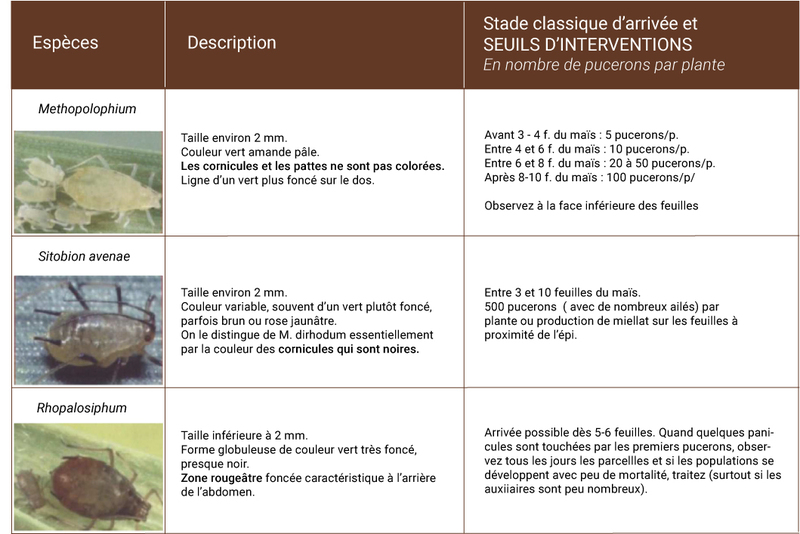 Damages will be exacerbated by unfavourable climate conditions. More scattered attacks may also affect more developed plants (2 to 6 leaves) with a wilting of the last leaf associated to a perforation on the collard resulting in the death of the plant. corn borers (Borer, sesamia) can attack sorghum. They do less damage than wireworm and until now, their impact on yields is limited. Symptoms are visible leaf perforations during bolting then by galleries in the lower part of stems. The agronomic control solution consists in finely grinding harvesting residue. An intervention with an authorised pesticide is possible in case of severe infestation*. Leafhopper stings result in little white spots on leaves. Symptoms are frequently observable but damages to the yield are limited. The presence of aphids on sorghum in June is frequent and, in most cases, does not last long. 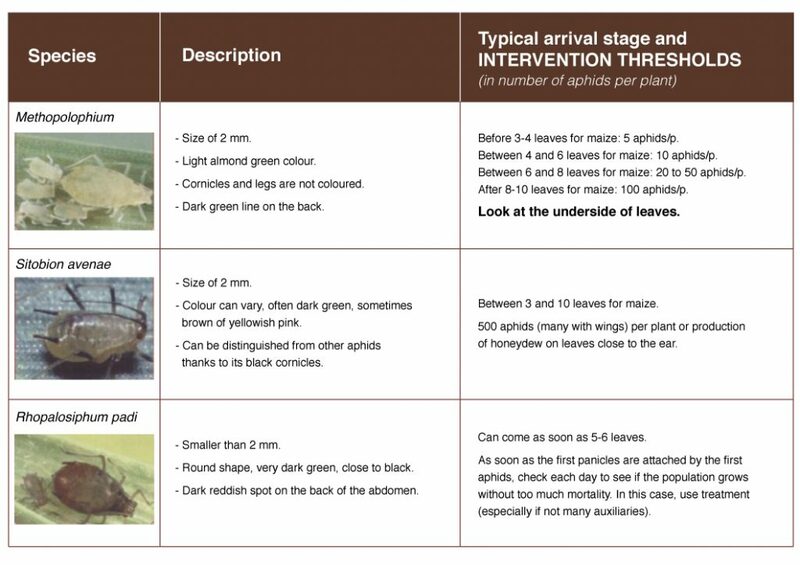 If colonies are growing quickly (see thresholds below) and if their presence lingers, it is possible to intervene with a specific product*. heliothis larvae, a polyphage Noctuidae which attacks several crops (tomatoes, chickpea, beans, maize, ..) can be punctually observed on sorghum. Damages focus on the panicle and result in the destruction of growing grains on a more or less significant part of the panicle. Attacks can cause a lot of damage in the worst cases. * (to know authorised products, see the applicable regulation in your country).